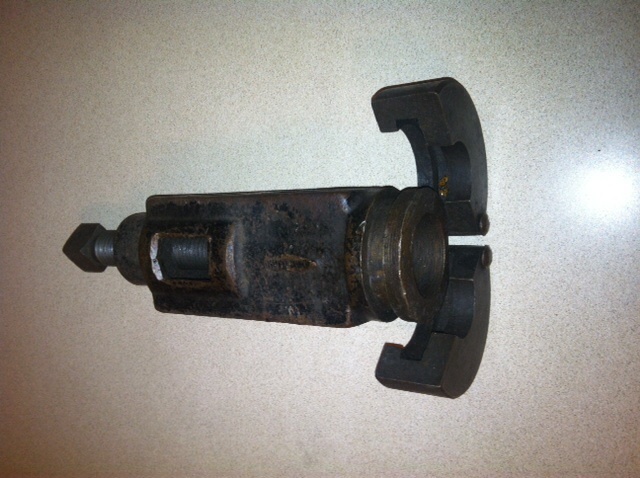 Model T Ford Forum: How to remove a pinion bearing inner sleeve? 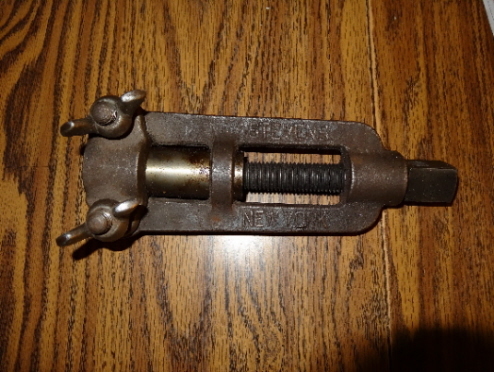 Model T Ford Forum: Forum 2013: How to remove a pinion bearing inner sleeve? Cut it off with a grinder. Just be careful not to cut too deep. Around here,we used a Stevens drive shaft sleeve puller. Even then they can sometimes be a real Bear. My old bud Bill showed me a "farmers" trick. Get a long piece of pipe just oversize of the driveshaft. Slip the pipe over the universal end of the driveshaft. Use the pipe to drive the sleeve off. Those old codgers knew some stuff. He passed 2 years ago and I still miss him. The MTFCA video on rebuilding the rear end, says to heat up the sleeve and it will pull right off. LOL heat the sleeve up my eye. Maybe if you get it hot enough that it's practically ready to melt off anyway. I had mine glowing between red and orange and it didn't change a thing. I mentioned this in the driveshaft bushing thread - pulling this sleeve off of my driveshaft was the most arduous, gruesome thing I've dealt with on the whole car. At a couple different points I could have been convinced it wasn't a sleeve at all but just a machined part of a 1 piece driveshaft. If I have to do another one, I will take my time and some cutting wheels from a Dremel tool. Rather than try and cut through it, I'll get it as close as possible and then hopefully split it the last little bit with a chisel. Some just wont come easy and some do. You can get a 'bad one' and mushroom the drive shaft if your not careful. Every once and a while you'll see a Stevens puller that's been broken and welded up at a sale. That whens it time to get the grinder out and do as Steve says. 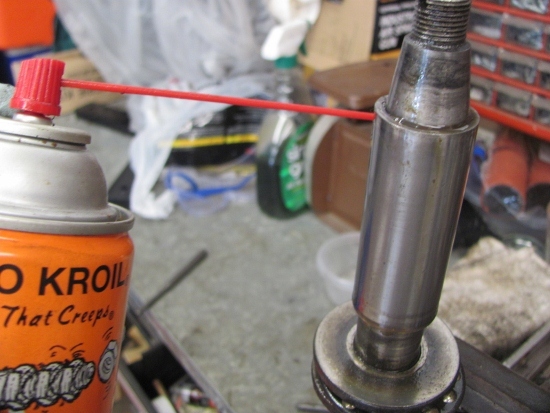 If you get them so hot that they are red or orange you are also expanding the drive shaft. It would need to be heated just enough to expand the sleeve but not the drive shaft. I would think with a rose bud tip you might be able to get the sleeve hot before the shaft. I have been warning folks about something I found in the archives but have yet to actually witness or heard of being found on a T. I found a drawing of an alternate sleeve that was .010 smaller than the standard 1" nominal inside diameter. That sleeve drawing was near to the factory number for the standard sleeve. What the drawing said was that it was being made so Ford could "reclaim mis-machined drive shafts" So if you see a shoulder on the drive shaft where the sleeve is then you are the first to have seen a real one and that machining was factory performed and I think you are also now a candidate to have to buy a new drive shaft since I don't think anyone is making an undersized sleeve nor would it be possible to make a bushing for any of the modern setups that count on the drive shaft being the standard 1.000"
I probably should have said that the standard sleeve is a press fit on the 1.000 drive shaft and I think I recall the ID of the sleeve as being .999"
i cut too deep. 0.010 smaller sleeve? That would explain why i had trouble driving it on. It broke apart later years though. 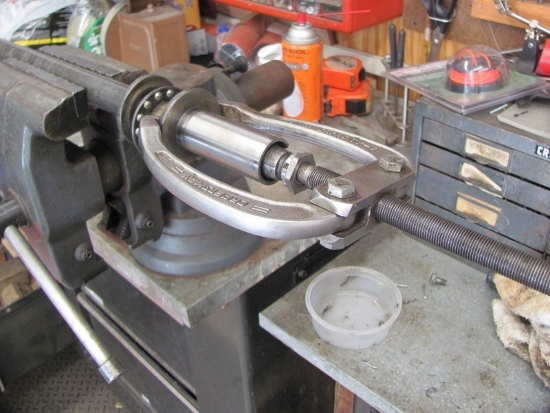 The Stevens sleeve puller works very well, this would be a good tool to reproduce but probably cost prohibitive. Here is my Stevens inner sleeve puller, different than the one above, hasn't failed me yet.